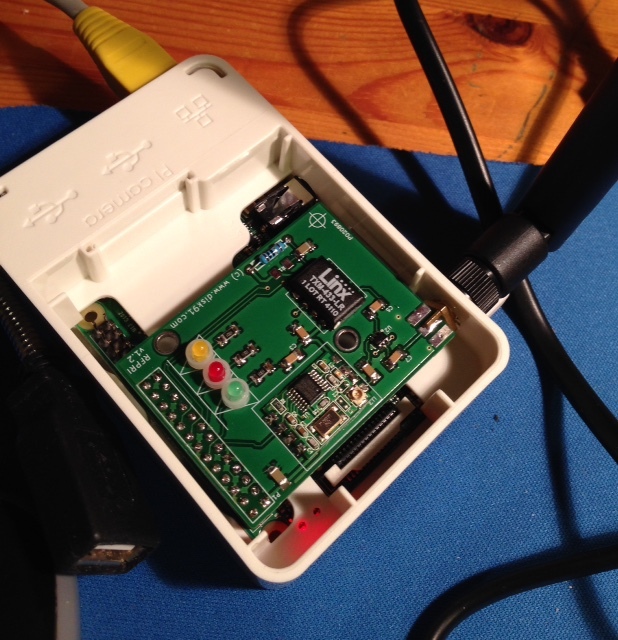 This entry was posted in Hardware and tagged B+, raspberry pi, rf433, shield. Bookmark the permalink. I was able to setup a cheap transmitter and receiver on a breadboard. with Raspberry PI”, and it is running very well. with your shield in V1.2 (for RaspberryPI B+) ? should it be maked by reverse programming ? I am interested in the shield V1.2. Please send me info on it. I sent you an email for the shield. About T/H-sensors, I can’t give you an answer but if 433Mhz you should find a way to by reverse engineering ; it is more or less complex. Take a look on INternet, most is here. I’m interested to buy a rfrpi shield. Please contact me. P.S. What’s the case of your Raspi in the photo of this post? I’m interested in buying an rfrpi shield. Please email me. Hello, I’m actually running out of time to fix some issue with raspberry-pi 2. I still have some unit working well with RPI1 and RPIB.